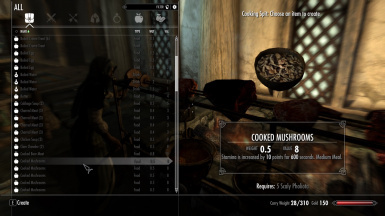 A simple mod that adds 18 new (and hopefully immersive) recipes to the game. All use plant ingredients found in Skyrim's wilderness as you travel and the meals have minor but long-lasting effects. You will need a cook-pot so I'd suggest mods like Campfire or Portable Cooking Pots. 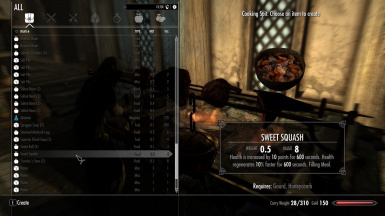 Pretty straightforward - Install ForagerFoodsRND if you use Realistic Needs and Diseases (Original or 2.0, and should work fine with USLEEP-RND). If you don't use RND, choose ForagerFoodsVanilla.